Where do you think this photo was taken? Surprise! It is at the departure area at Narita International Airport. 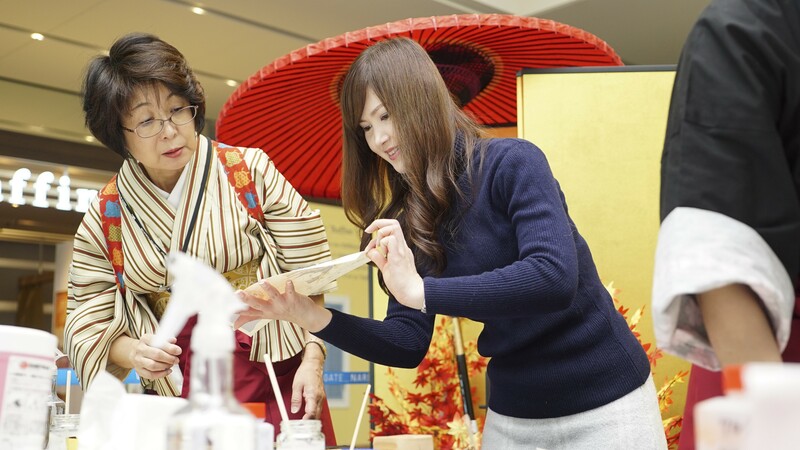 There are events happening every day at the “Japanese Cultural Experience Corner." There are varieties of events throughout the year, perhaps it will be the last stop for everyone’s trip to Japan. Well, what kinds of things that you can experience here? Go back to Edo Period and paint! This time we are going to make ukiyo-e (Japanese woodblock prints). Some of you may wonder, what is ukiyo-e? Ukiyo-e refers to the paintings developed during the Edo period. That’s the time when photos did not exist, and ukiyo-e, just like photos and posters, was the entertainment for the ordinary Japanese people. Just like how we put on the wall photos of our family trip, and posters of favorite sport teams or players as well as artists. Those people at that time owned paintings like the scenic view of Mt Fuji, kabuki actors and beautiful ladies. How to make ukiyo-e is complicated and takes long time. You need many printing blocks and lots of colors. In some cases, close to 100 types of colors were used so in old times they made about 100 printing blocks for the printings. Because of those the different colors, the paintings were so colorful! This time we made ukiyo-e with 6 pieces of printing blocks. Here’s the video we took, so please watch! As the colors were added in one by one, it became so beautiful! Done! I couldn't believe that I could make such a pretty ukiyo-e by myself. As you can bring it home with you, it is such a good souvenir! It takes about 15 minutes to complete and is free of charge. English speaking instructors are available, so you don’t need to worry even you don’t speak Japanese! 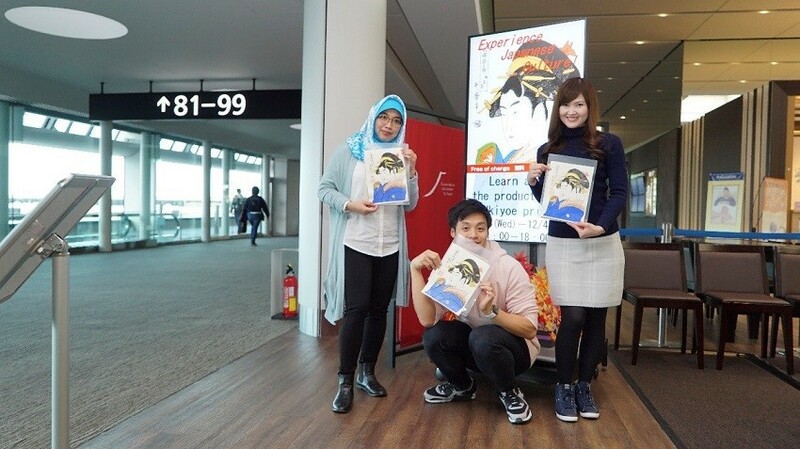 How about this Japanese cultural experience before you fly home? Please drop by when you are coming to Japan! Don’t know what to do while you are waiting for your flight at Narita International Airport? 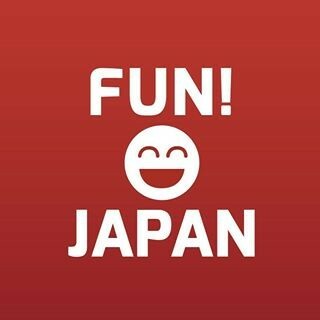 How about Japanese cultural experience? 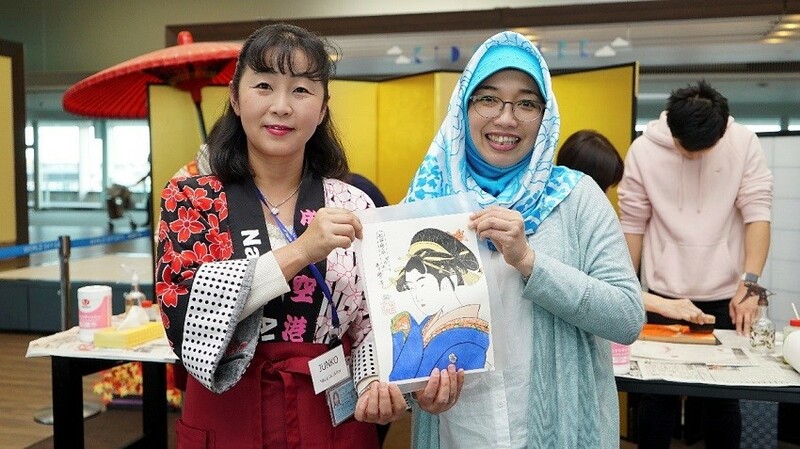 It is a great opportunity to understand more about Japanese traditional cultures. 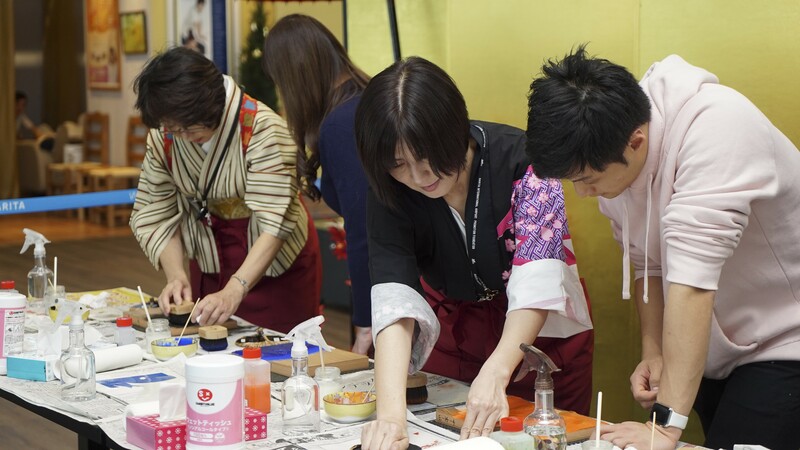 Apart from the ukiyo-e making, you can try out others too. They include calligraphy, tea ceremony, origami, ukiyo-e printmaking, kimono dress up, armor wearing, etc. Please feel free to take part in. The events are free of charge and are held every day at the transit area in Terminal 1 and 2. Terminal 1 "Japanese Cultural Experience Corner"
Terminal 2 "Japanese Cultural Experience Corner"
Experience TOTO’s toilets that promotes Japanese toilet culture and technology! GALLERY TOTO? Is it an art museum? GALLERY TOTO is a place where you can get to experience Japanese culture and it has become very popular. With its name of “GALLERY” you may think that it is an art museum. But wait, it is a toilet? Ah, and that’s “TOTO”. Yes, this is the Japanese modern culture! As from what we heard, the concept of the TOTO’s toilet gallery is really a “Japanese Culture”. It expresses things symbolizing Japanese cultures and sceneries in its own perspective. GALLERY TOTO promotes the beauty of Japanese cultures and uniqueness along with its state-of-the-art toilet technology. From the layout at the entrance, there are 4 toilets each for male and female. Let’s go in and find out what is it! All are single rooms and very fashionable. The wallpapers, layout as well as the design of the toilet are all different. The toilet rooms are like art museums. That’s why “GALLERY TOTO”! It is too stylish, and we, FUN! JAPAN staffs were wondering if it is OK to use it. 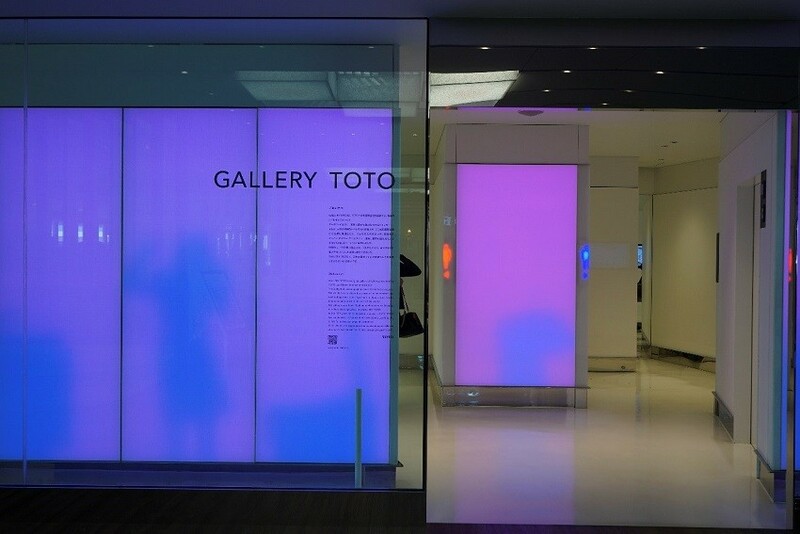 GALLERY TOTO is located at Terminal 2. For those who might use Terminal 2, it is a place where you can visit for fun! Please drop by!